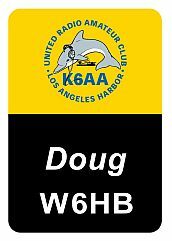 The United Radio Amateur Club (URAC) was formed in 1927 and serves the Los Angeles harbor area. During the 1970s, URAC gained worldwide recognition when it spearheaded the fabrication of kits with printed circuit boards for an extensive line of projects. These were given away at hamfests and ARRL conventions. URAC manufactured 500 kits for the IARU 20-meter transmitters and receivers. that were provided to the ARRL to promote amateur radio in third-world countries. The primary field operations site for URAC is the Angels Gate Park directly above the Point Fermin Lighthouse and the Korean Bell. This former Fort MacArthur reservation overlooks the Los Angeles and Long Beach harbors and Pacific Ocean. You will find URAC members there on Field Days and running Angels Gate and Point Fermin Lighthouses during lighthouse events. This location also provides a great communications control point for various public service events URAC routinely supports. In 1987, the Los Angeles Maritime Museum invited URAC to become one of its permanent volunteer groups to educate visitors on radio communication. Thus began a relationship that has provided a permanent meeting place, a VE testing site and the K6AA operating station that has made friends all over the world. Situated on the main channel of Los Angeles Harbor in what was once a ferry building, their antennas sprout from behind a clock tower 21 meters above salt water. URAC members man the station Tuesday through Sunday, demonstrating communications to everyone -- from classes of local school children to museum visitors from all over the globe. Members also further the amateur radio service by hosting scoutings annual Jamboree on the Air and operating stations for IOTA, World Port weekend, and wherever their skills are needed. The United Radio Amateur Club badge is made using our full color process. The URAC logo appears in the top-center of the badge placed over a picture of the Los Angeles Maritime Museum. Your call sign and first name appear in white on a black background on the lower portion of your badge. The URAC name badge is $12.50 and includes our standard safety pin fastener. Click here to see other fastener choices. For additional information on the United Radio Amateur Club, please visit their web site or send an e-mail to the club mailbox. To order, please select the United Radio Amateur Club using the CLUB ITEMS drop-down menu on our order form.